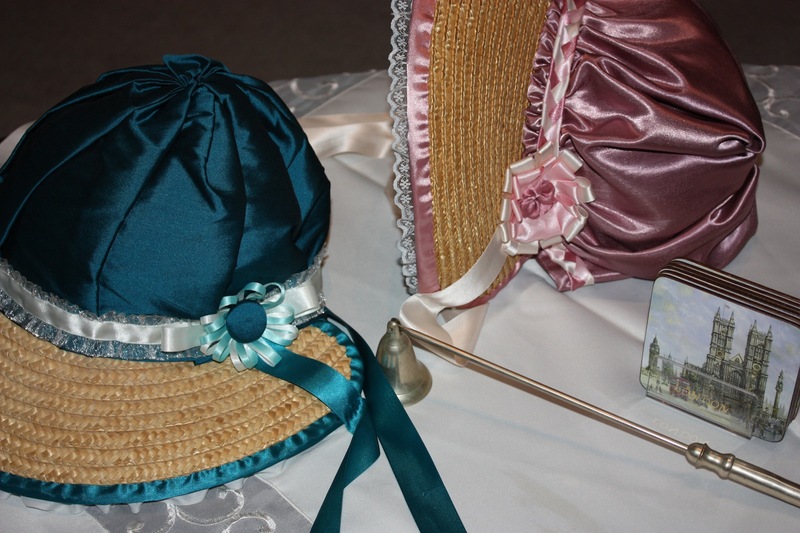 One of the workshops I took at the Jane Austen Festival in April was on making a Regency day cap. Generally speaking, I don’t really like the look of historical caps but I thought that being married and having attained a much more “mature” age I probably should consider wearing one occasionally with my costumes. The other benefit of them is that it stops your hair getting stuck in straw bonnets! 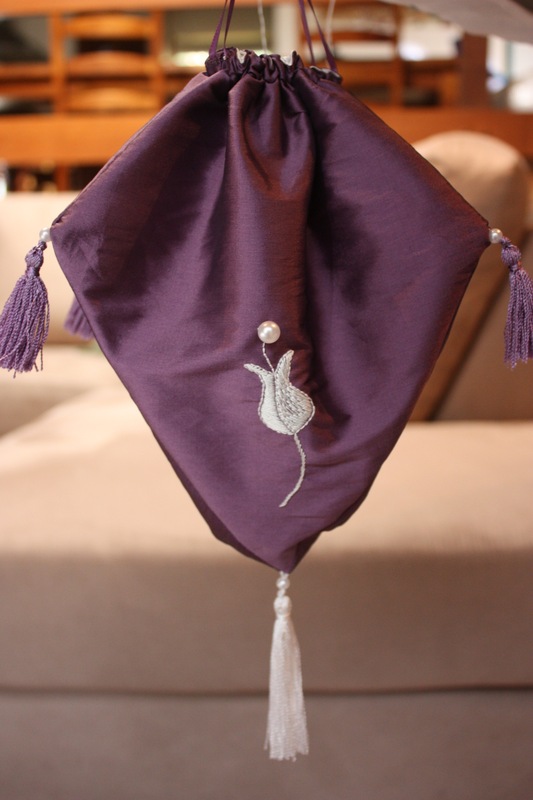 At the workshop, we were provided with all the materials and instructions to make this cap but only really had time to learn the stitches and begin the first few edges of hemming. So this was one of the first projects I took out to finish once I arrived home. 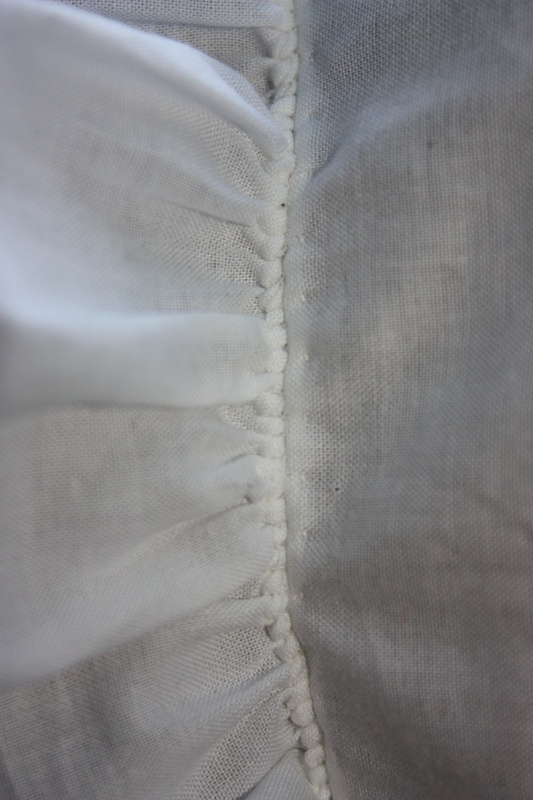 A rolled hem is a common stitch used in historical sewing, particularly for hemming the edges of ruffles and fine linens. 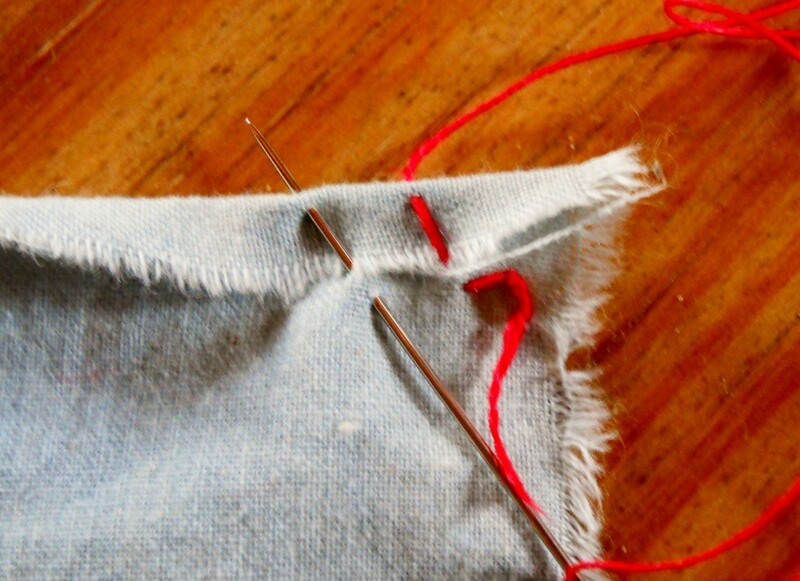 There are many tutorials online for handsewing a rolled hem, so I will not repeat one here except to include a helpful photo. 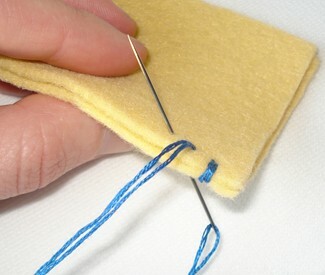 This is a great stitch for seams and is often used in historical stitching. Once again, there are many tutorials online for this, but I have just included a photo for demonstration. 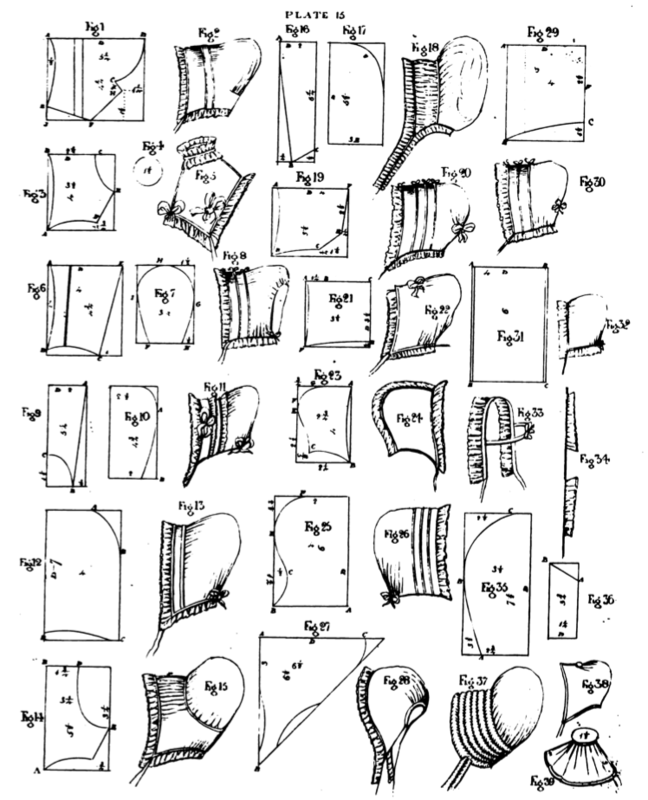 Patterns for caps; from The Workwoman’s Guide (1840). Whilst these are Victorian caps, Figure 13 is the most similar to mine, using a horseshoe shaped capote. The pattern I have used for my cap was supplied at the workshop, but there are patterns for many sorts of historical day caps online (such as the pattern from Kanniks Korner) or you could make up your own pattern. the ties – cut two for tying under the chin. My cap also had a small casing at the centre back (at the nape of the neck) to accommodate a cotton-tape tie. This made it adjustable around the back of the neck. All the raw edges of each piece of my cap were neatened first, either by using the whipped gather (for any gathered edges) or the rolled hem (for all other edges). Then the pieces were sewn together with a whipstitch. This method is a good one because it means that there are no fraying edges on the inside. 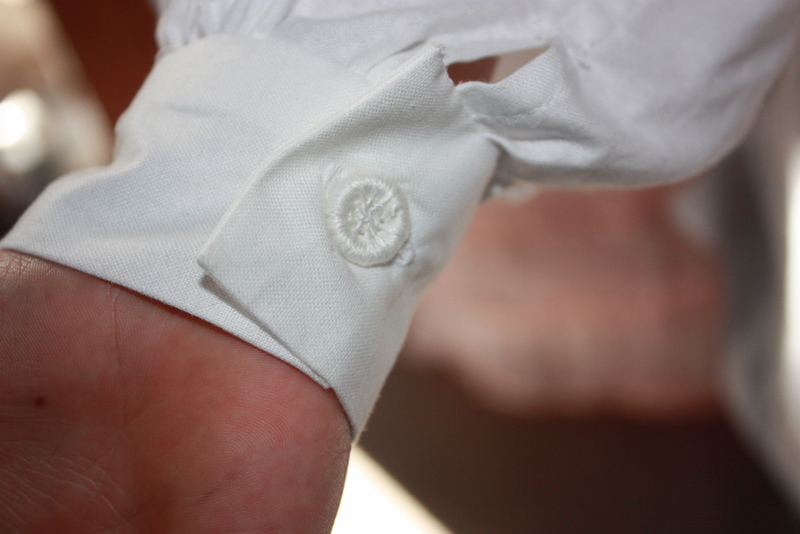 A close up of the stitches attaching the frill to the band. This is the right side and you can see how the gathering looks when finished. Front view of cap: my daughter is modelling it for me. I really enjoyed handstitching this cap, and I think it looks really cute! (My husband wasn’t as enthusiastic and I think the kids just said it looked good to be encouraging…) I found it so therapeutic to sit and handsew in the evenings that I am now busy trying to decide what else I could make fully handstitched. Kanniks Korner: Pattern for Women’s and Girl’s Caps – scroll down a little to find the relevant pattern. 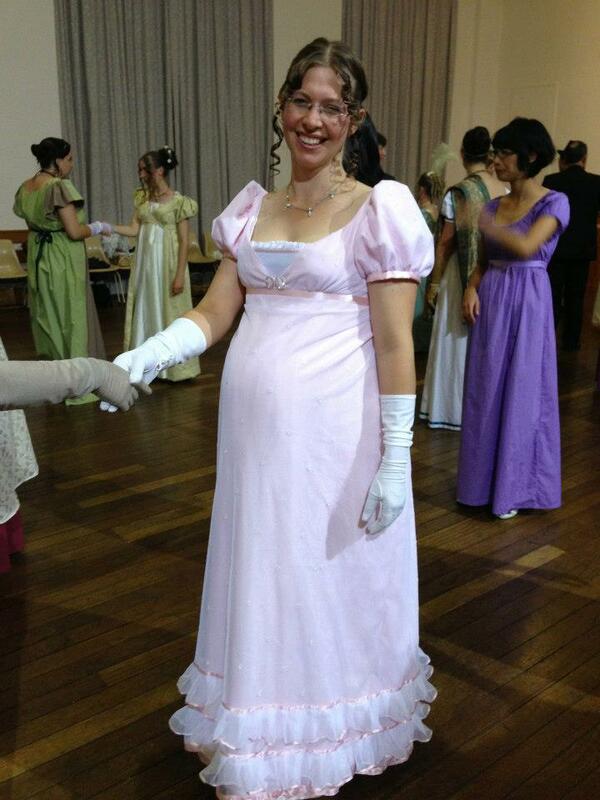 On the 18th of April I travelled to Canberra, Australia, for the annual Regency event, the Jane Austen Festival! The Festival began with a casual evening of eating, last minute sewing and chatting at the Director’s house. I also got the opportunity to peruse some old dancing books, gaze at beautiful paintings of ballroom dancers and handle some extant garments. On Friday the day began at St Johns Church with a dancing session to learn the basics of the Country Dance. In the next session I also learnt the rudiments of the Cotillion and the Quadrille. The Cotillion was the forerunner of the Quadrille and, as I have done a lot of Quadrille dancing in Australian Colonial dancing, it was interesting to find out how the dance had developed. 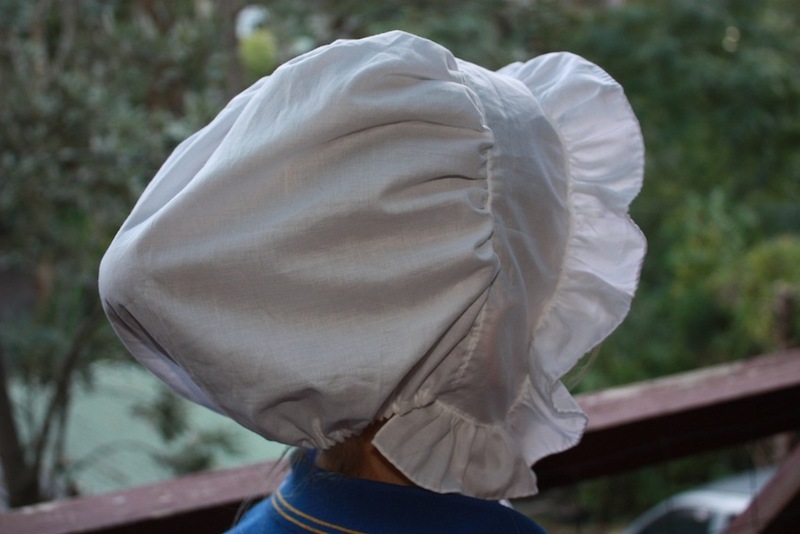 In the next session I had my first proper millinery lesson, making a late Regency bonnet out of buckram and wire. I am really excited about finishing this project now that I am home, as then I will be able to extend my previously meagre hat-making skills to the much more complicated Victorian hats! Later in the afternoon I managed to view some more extant garments; a cotton day dress, a bib-front silk ballgown, a spencer, and chemise. I find examining the construction techniques of dresses of this era fascinating and I wished that I had more time to take some notes. For my last workshop of the afternoon I learnt to make Dorset Buttons. I have been wanting to learn this technique for a while and I am really pleased with my first attempt! The evening session – the “Dinner with Darcy” Variety night – began with a lovely traditional English roast dinner. We were entertained with delightfully humorous Regency-themed plays and lovely opera-style singing. A fashion parade, truly a feast for the eyes, illustrated the main shifts of fashion from 1780 through to 1820 and even featured one of my own garments! There were even some fancy French dances beautifully performed for us. The night finished with a fine British sing-a-long, featuring The British Grenadiers, Greensleeves, and Rule Britannia. Muskets were notoriously unreliable in hitting targets so in order to improve their effectiveness as weapons, the company were required to shoot in unison at the command of their leader. Saturday began with some more dancing workshops to teach the Essentials for Capital Dancing for the coming ball that night, and I also managed to learn some Finishing Dances that were often danced to conclude a Regency evening. 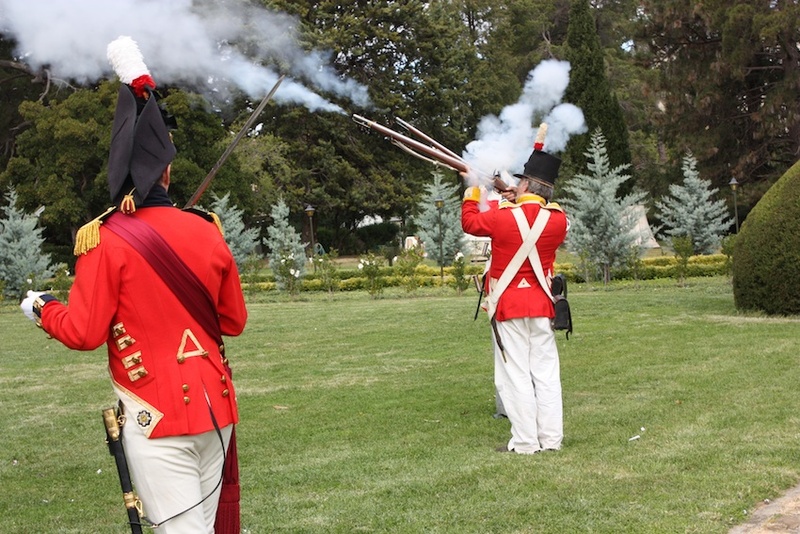 Over lunch we were able to view a company of Grenadiers loading (or pretending to load…) and firing their muskets! They also did a demonstration of how bayonets were attached to the end of the musket in order to use the firearm as a hand-to-hand combat weapon. A Death Head button; blue cotton thread wrapped around a disc. I spent the afternoon running a Chemisette Making workshop and then learnt how to make Death Head buttons, which are discs of wood or horn wrapped in thread. Whilst my example is fairly plain, different coloured threads can be used to create a contrast in the weaving pattern and the result can be extremely decorative. I am planning to use this new skill to adorn an eighteenth century frock coat for my husband. 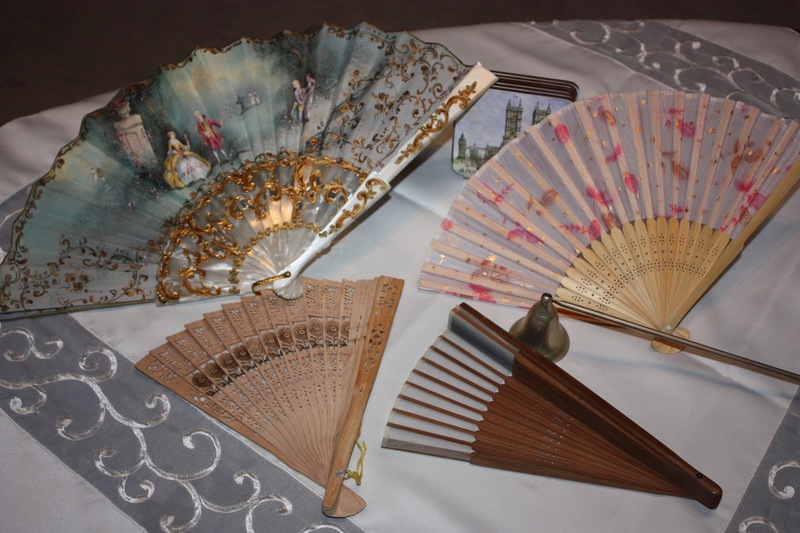 I also managed to view a study table of extant examples of Regency accessories during the course of the afternoon, examining coin purses, reticules, fans, jewellery boxes, and shoes. My sister and I dancing at Saturday night’s Grand Napoleonic Ball! In the evening we all donned our ballgowns and jewels and attended the Grand Napoleonic Ball, dancing until midnight! It was great to see a completely full hall of enthusiastic dancers and costumers. Aside from a quick trip upstairs for a photo shoot, I think I danced every dance and I was VERY stiff and sore the next morning! My sister and I in the horse and carriage. 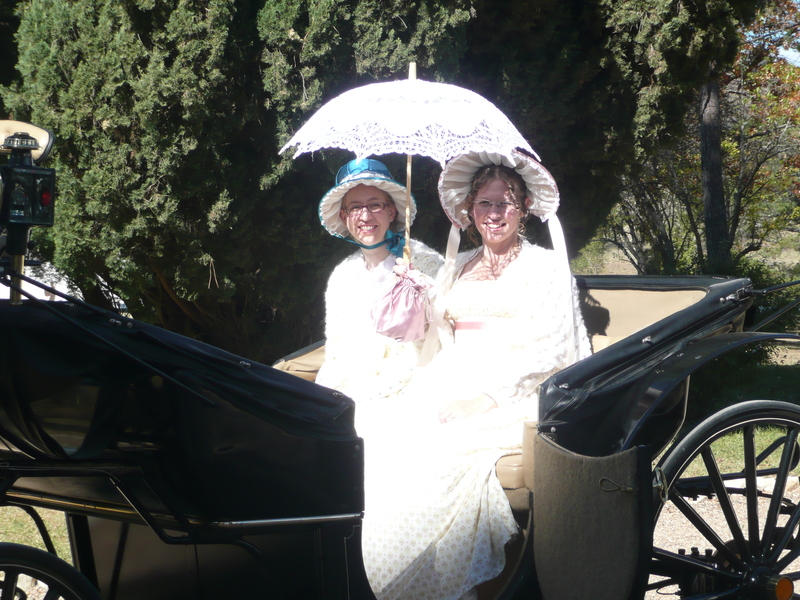 On Sunday we met at the historic grounds of Lanyon Homestead for a “Picnic at Pemberley”. We were all conducted on a tour of the homestead, gardens and outbuildings, and then had a lovely lunch and a horse and carriage ride. The day was gloriously sunny and provided me with the perfect occasion to use my new parasol! The afternoon was spent back at St Johns Church with a Country Fayre, including various stalls, maypole dancing, a fencing display, more dancing and a concert. 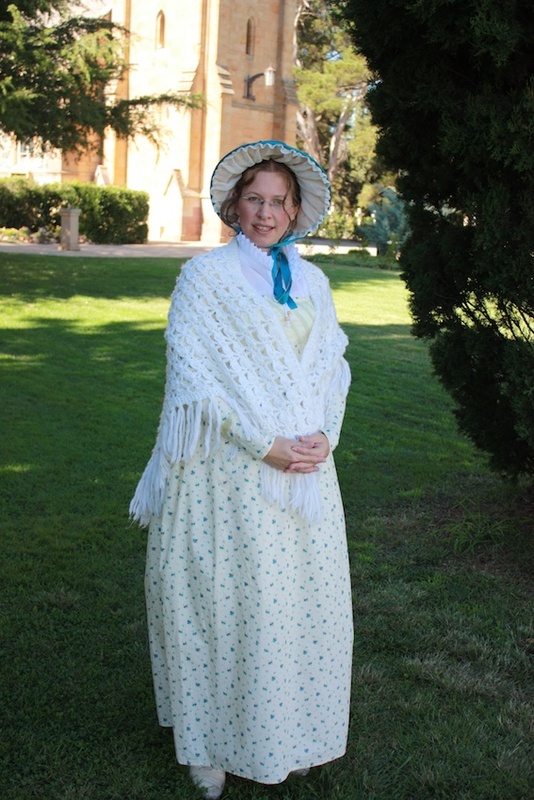 My latest ballgown and my entry into the JAFA 1813 Costume Competition. 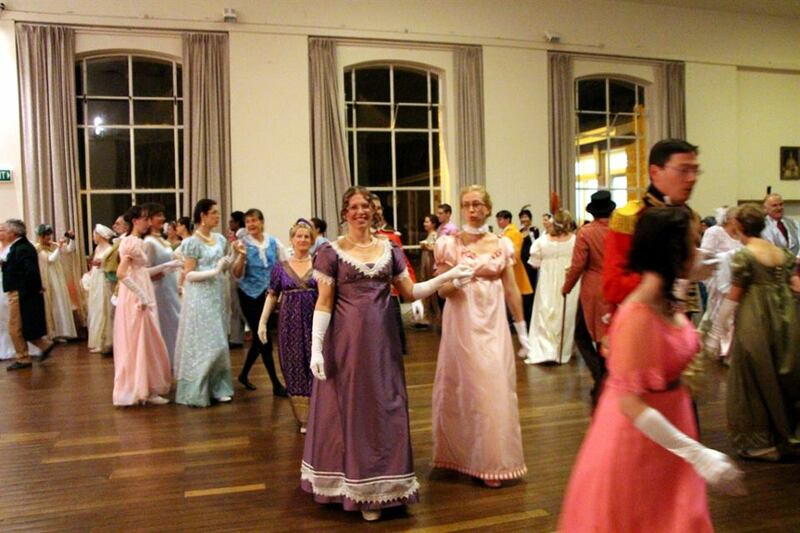 The Jane Austen Cotillion Ball was held in the evening and was a great conclusion to the festival. The entrants in the 1813 Costume Competition paraded in their garments and the winners were announced – a three-way win of which I was one! There was also a Regency Gentleman’s Costume Competition this year, with entrants falling under the sub-categories of Mr Darcy, Mr Wickham, Colonel Fitzwilliam or Mr Collins. As part of the competition, the entrants had to pretend to be single, and the “Mr Collins” entry was particularly entertaining! I really have loved attending this festival over the last two years, and I would highly recommend it! It is full of friendly people who are all eager to try new things and learn from each other. This year we even had visitors from as far as France and America! The festival also offers a great opportunity for people who are interested in learning about a variety of topics relevant to the Regency era, such as history, fashion, dancing, sewing, Regency entertainments and even war. My only lament is that there is not enough time to do all the things I want to do. Even so, I am looking forward to next year already! My tenth stop in my Regency Journey is to look at some of the various Regency accessories that will complement my Regency ensemble. Once you have your appropriate undergarments and outer garments, consider searching for some of the following items. This is what I will be taking to the Jane Austen Festival. Reticules – I made mine! A fan or two or three – I have a bit of a collection going. Some of my fan collection. The plainer ones are probably more strictly Regency. 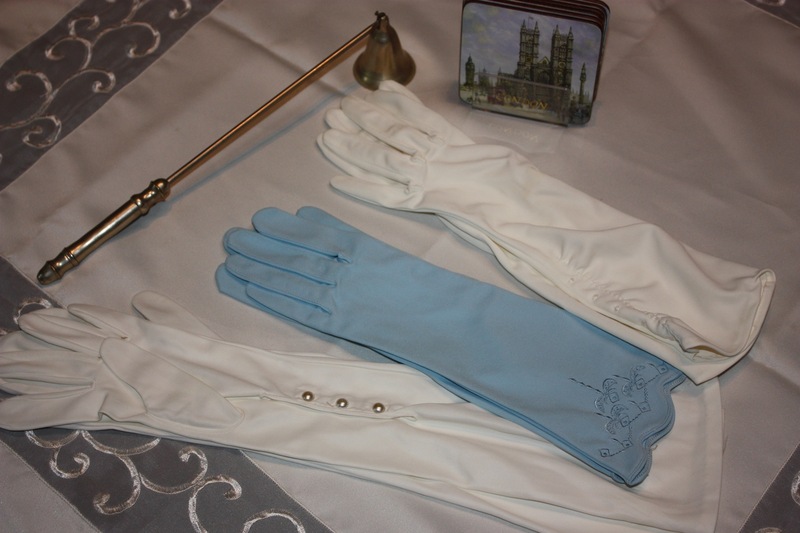 Elbow length gloves for evening wear – Regency ones are a little baggy around the elbows. A few of my vintage glove collection. The shorter ones will do for daywear if it is cold, but the longer ones reach to my elbow and have pearl buttons on them, which will match my gown nicely. 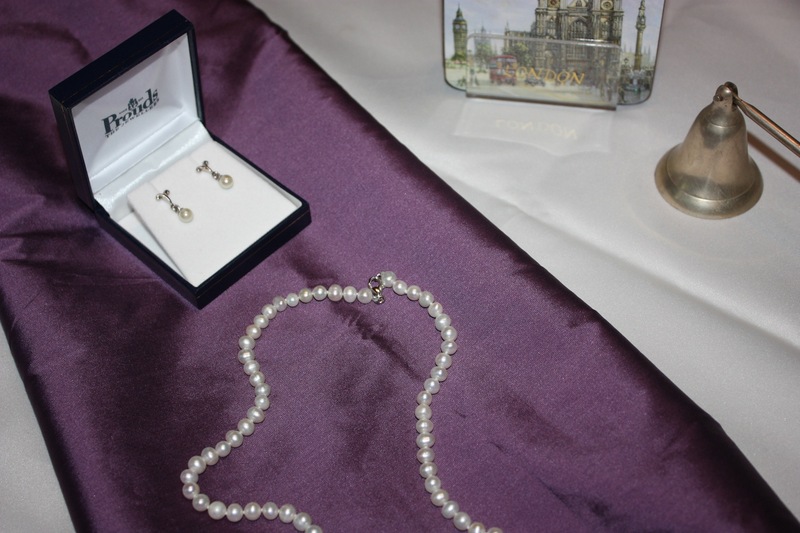 Jewellery – Little crucifixes on necklaces were very popular. I am also taking some pearls for the ball. Some pretty pearls! I have yet to find a crucifix that looks right for Regency. 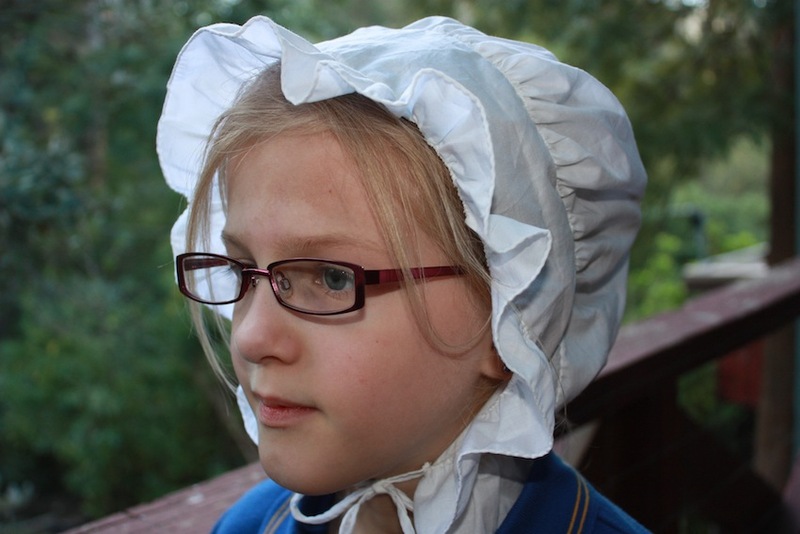 Headwear – I have made two bonnets which will match my day dresses. Evening headwear includes ostrich plums or turbans, but instead of making these I decided to dress my hair with ribbon or a length of pearls for the ball. Shoes – For during the day, half boots or ankle length leather boots were worn. For the evening, flat slippers or ballet flats can be used for dancing. Parasol – Whilst lovely and elegant for a Regency picnic, this is more of a desirable extra! The final stop on my Regency Journey will be to practise some Regency hairstyles. – coming soon! 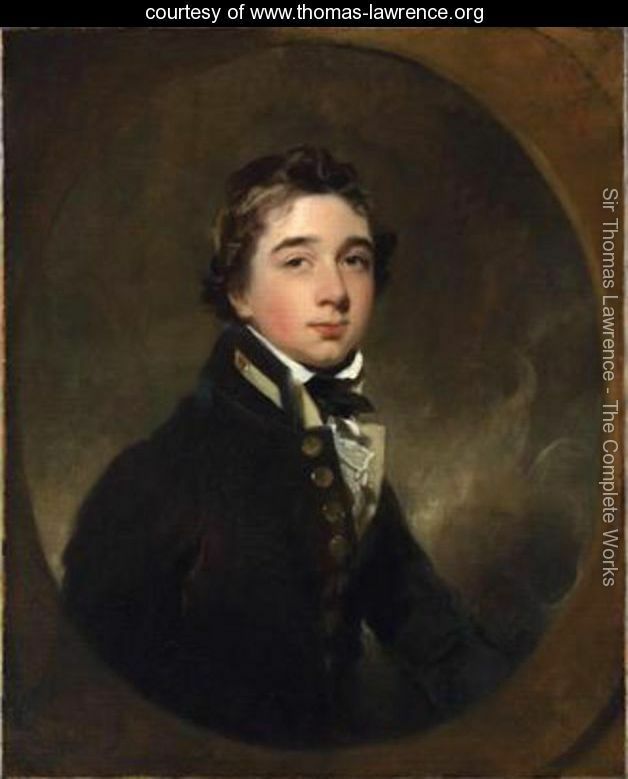 You can follow all of these posts in order at My Regency Journey. Regency Costume Accessories – Jessamyn’s Costume Companion has useful links and suggestions for costume accessories, as well as some ‘How to’ links. Regency Hairstyles – Locks of Elegance has a few really simple but pretty Regency hairstyles to try. 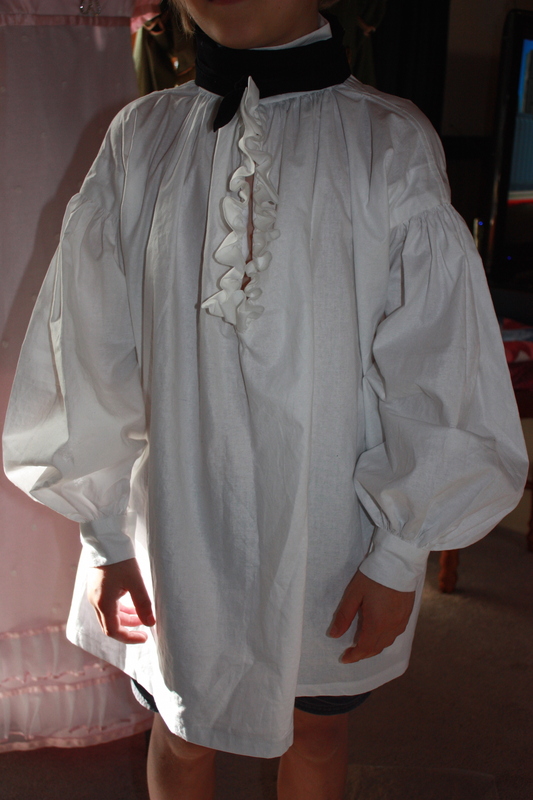 The seventh stop on my Regency Journey is to make a chemisette to go underneath my day dresses. 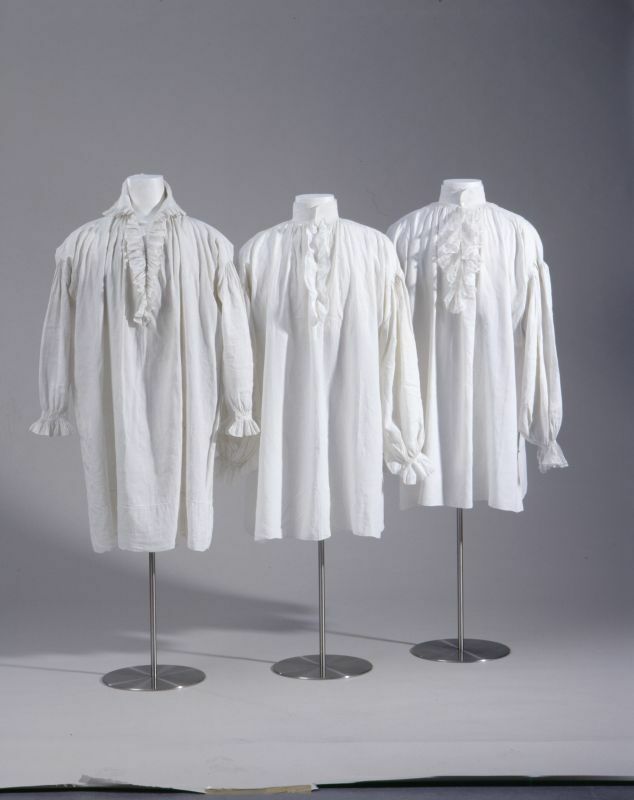 In the Regency era, a chemisette was commonly worn underneath a morning dress to fill in the neckline. It covered the visible shoulders and chest to make the outfit appear more modest. They were usually made of a fine lawn or cambric, or a thin muslin. 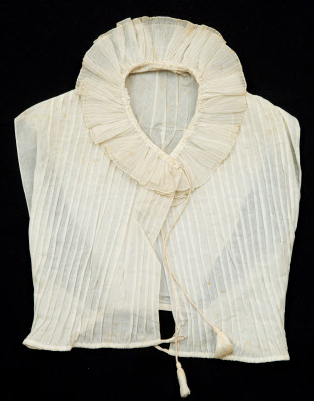 Other acceptable garments to properly cover the exposed neck and chest included a fichu or neck scarf. In contrast, evening gowns were much more revealing, with the dresses cut very low around the bust and the sleeves worn quite short. 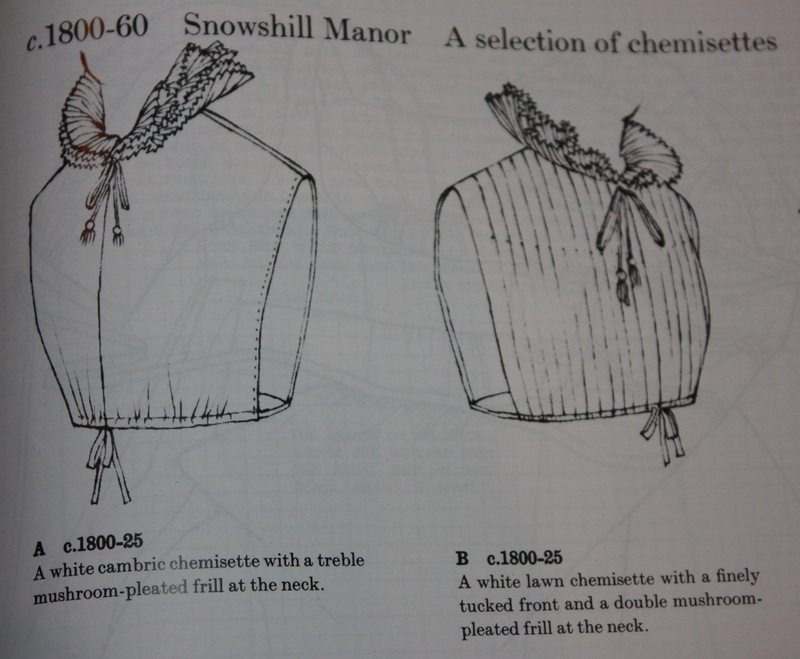 I used the pattern for a chemisette (dated from 1800-1825) in Patterns of Fashion 1, by Janet Arnold. Two chemisettes; pictured in Patterns of Fashion 1, by Janet Arnold. First, I traced and cut out the pattern on 1/4 inch grid paper. The front and back sections traced on grid paper. 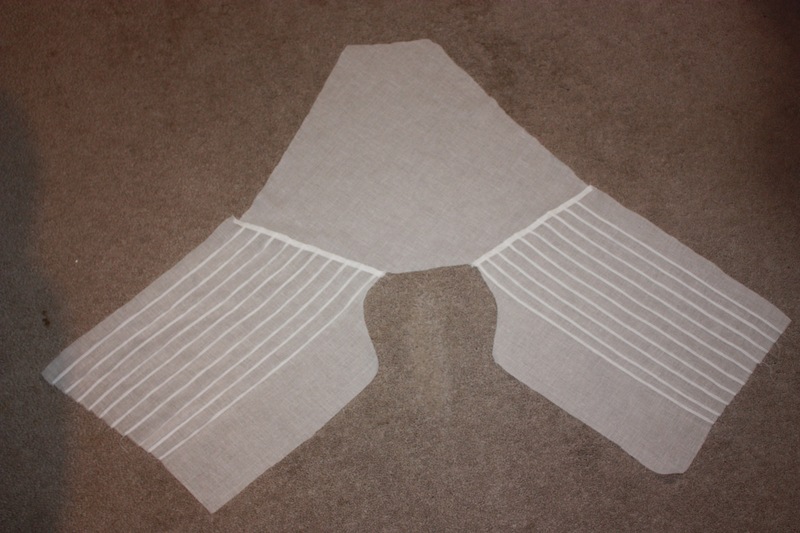 Then I made small vertical tucks to the front panel, from the shoulder seam to the bottom edge. Unfortunately Janet Arnold does not show exactly how these were done in this example, so I made them up myself! I did ten 1/8″ tucks, spaced 1 inch apart. 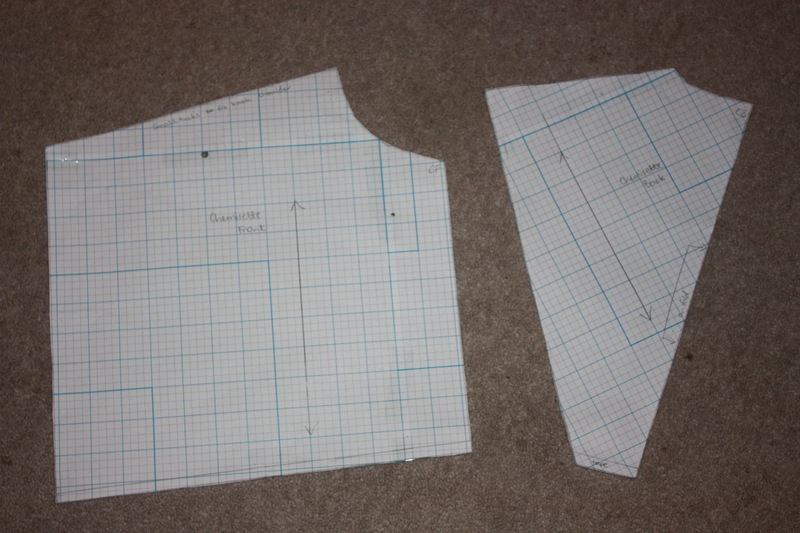 Once the front panel fitted the back panel smoothly, I sewed the shoulder seam, using a flat felled seam. 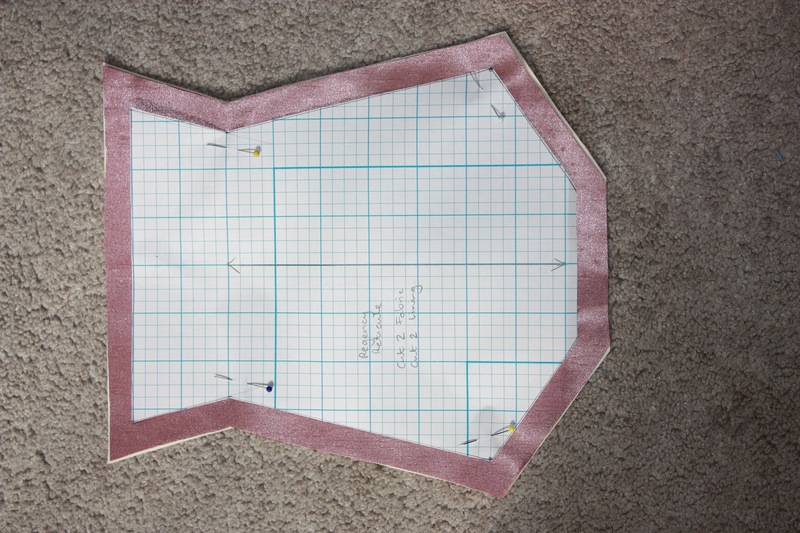 The shoulder seams sewn, with the vertical tucks in the front panels. 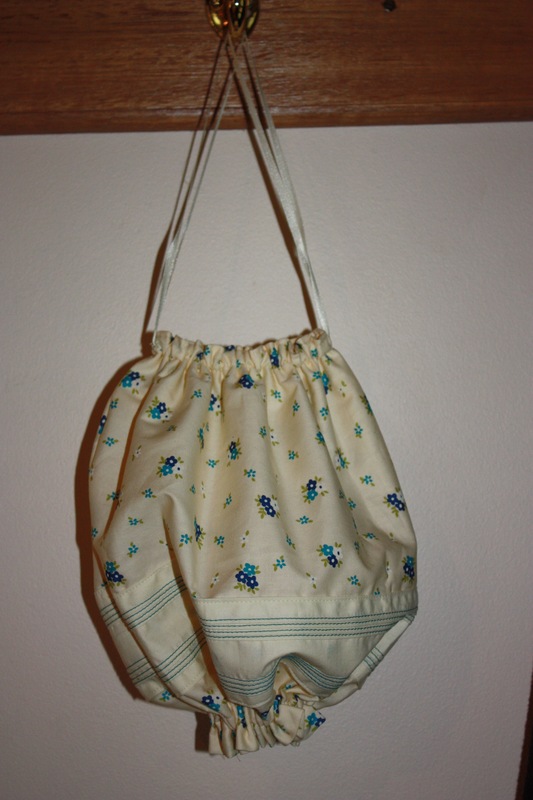 I hemmed the side seams (where the arms go) and the centre front opening, and then sewed a casing along the bottom edge for a drawstring or ribbon to go through. Once the ribbon was threaded through the casing, I sewed a stitch in the casing at the centre back to anchor the drawstring. I cheated a little for the mushroom-pleated frill, using a mushroom-pleated length of organza lace I had in my lace stash. I attached two lines of the lace to a piece of ribbon (1cm wide). One line of the lace was sewn to one edge of the ribbon, and the other line of lace to the other edge, so that one layer nicely overlapped the other. 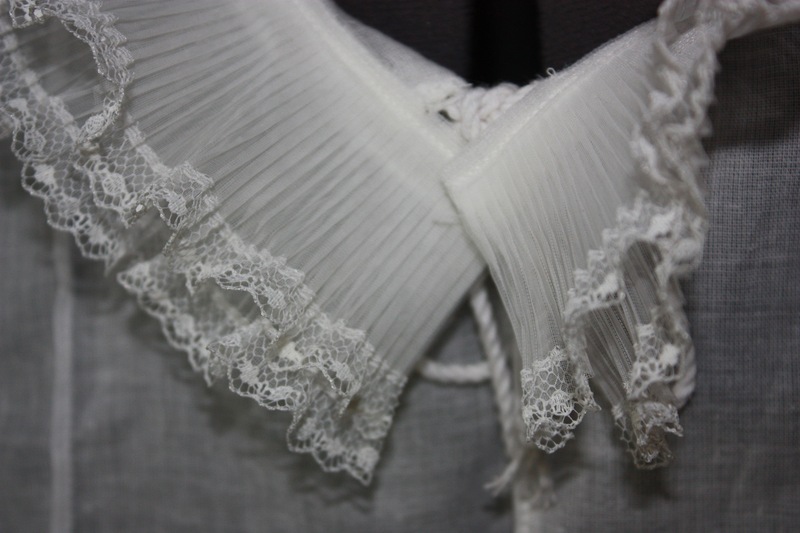 Then the “lace collar” was attached to the bodice so that the right side of the lace was on visible to the outside when the frill was folded down. A close-up of the lace frill, with the one layer peeping out beneath the other layer. 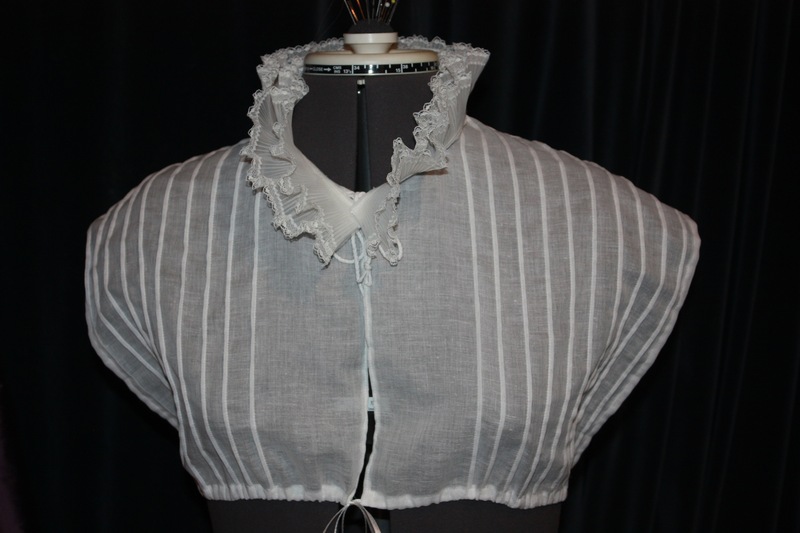 Janet Arnold has instructions on how to make the frill if you are not inclined to cheat like me! Use a 90 inch length of material cut on the straight grain (2 and 1/4″ wide at the centre back graduating to 1 and 1/2″ wide at the centre front). There are three layers of frill in her left-hand picture and two layers in the right-hand sketch. These layers are then mushroom-pleated onto tapes which are then fitted onto the collar. Mushroom-pleating is a very fine tight pleat that resembles the underside of a mushroom. To finish it off, I added two lengths of cord at the top of the centre front to do up the chemisette. 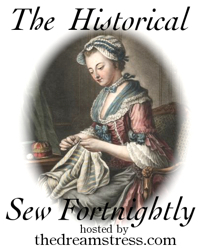 The next stop on my Regency Journey will be to make a ball gown. 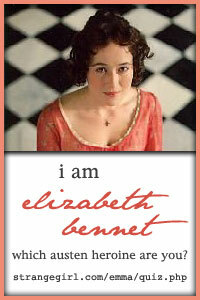 To read all my posts in order, go to My Regency Journey. This week I received a special gift in the mail from a friend. It was a little children’s board book, but what got me most was the title! 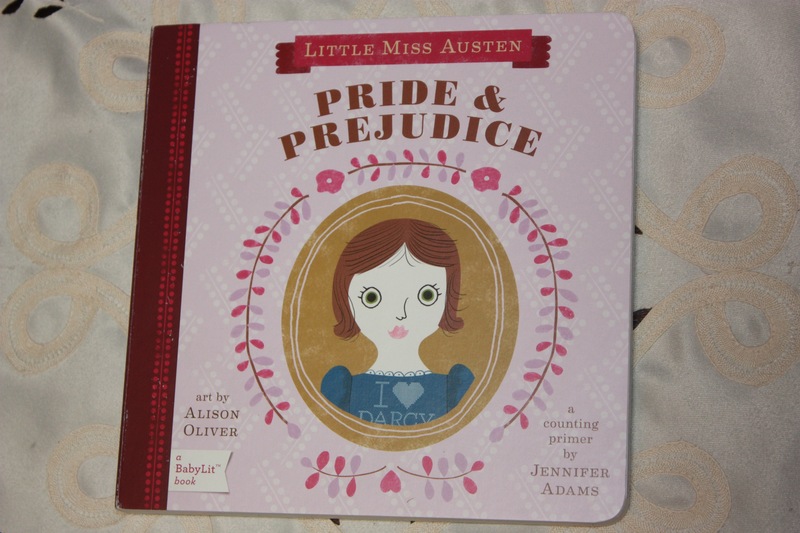 It is a basic baby’s counting book, using some common items mentioned in Jane Austen’s novel, Pride and Prejudice. 4 Marriage Proposals: My favourite page! 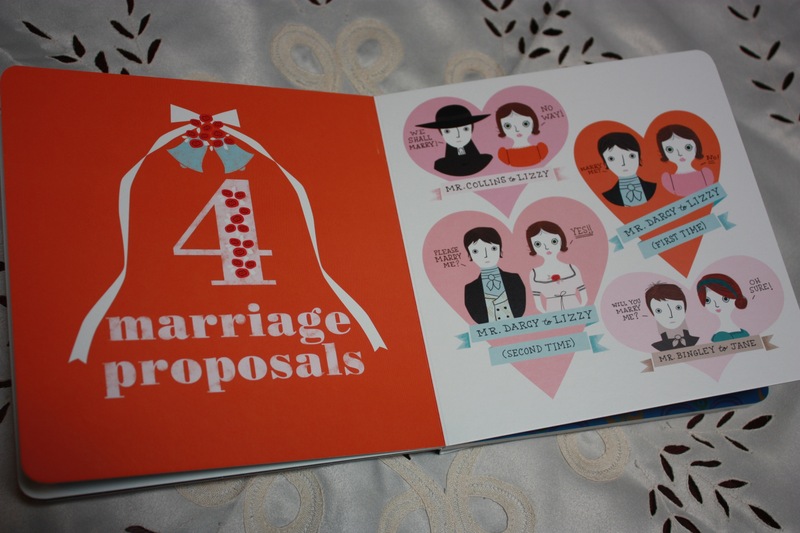 My favourite page is the one showing four marriage proposals! This book is one of the BabyLit series, by Jennifer Adams, which tailors literature classics for pre-reading young children. Some of the other books in this series are: Jane Eyre, Romeo and Juliet, and Alice in Wonderland. They are published by Gibbs Smith and illustrated by Alison Oliver. 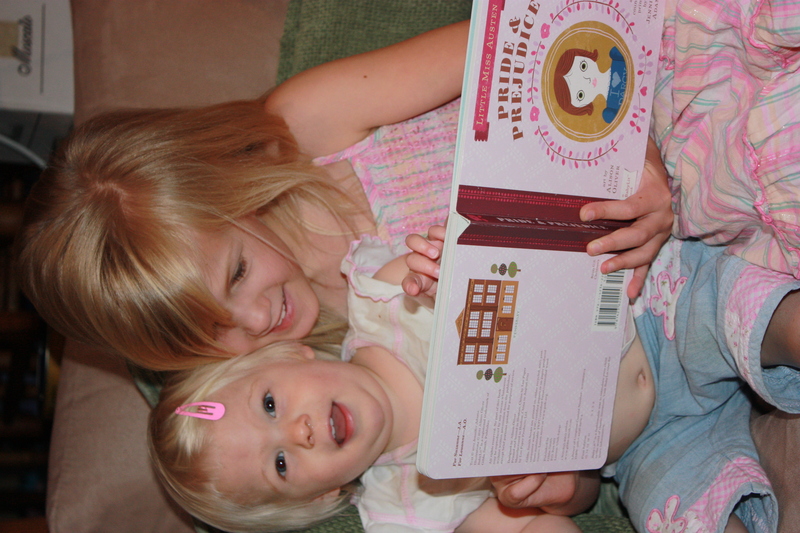 My two angels, having their first introduction to good literature! Baby’s literature! This is my cup of tea!